Summer in Chicago calls for as much outdoor time as possible, and picnics under the shade of a tree or beneath the starry sky are THE way to dine come summertime. Dig into your picnic basket beside a tranquil, hidden lily pond or dine upon a blanket while enjoying a free movie. There are just so many prime picnicking spots in Chicago. Take your pick! The Lurie Garden in Millennium Park is a peaceful, 5-acre garden that celebrates Chicago&apos;s transformation from a muddy marsh to a bold and powerful city. A 15-foot-high "shoulder" hedge encloses the garden on two sides, representative of Carl Sandburg&apos;s famous description of the "City of Big Shoulders," and a hardwood footbridge over shallow water divides the garden diagonally. 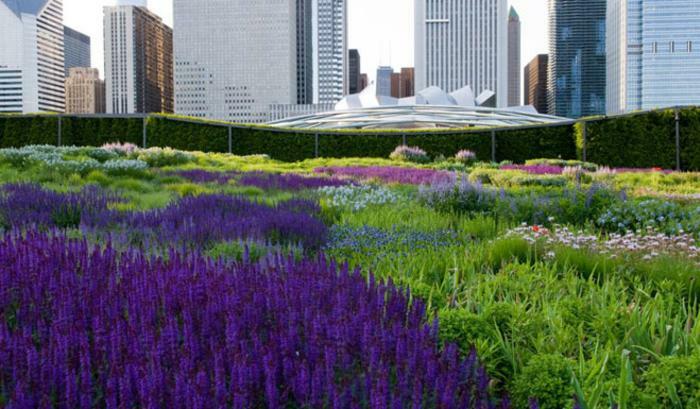 Lurie Garden is at it most colorful from June to August, making for a perfect picnic among the flowers in full bloom. Head to the garden&apos;s boardwalk, and f sit on its 24-inch-wide step that leads down to a 5-foot wide canal. Here, picnickers dangle their feet in the jet-flowing water, while watching for bunnies, bumble bees, and birds. In act, 27 species of birds have been identified in the sensory, sustainable garden, and they&apos;re always happy to provide a soundtrack for peaceful picnickers. The garden also hosts a number of events, from yoga to birding workshops, and even boasts its own bookclub. Download the Lurie Garden Plant Life Guide for help with identifying the many beautiful plants that call this green corner of Chicago home, or take a free tour to learn all about its plantings. Head to the Park Cafe at Millennium Park to cool off with an ice cream while you wait for your picnic lunch to go (and don&apos;t forget to include some classic Chicago hotdogs!). Chinatown&apos;s Ping Tom Memorial Park is a 17-acre site that started life as a Chicago and Western Indiana Railroad yard located along the edge of the South Branch of the Chicago River. 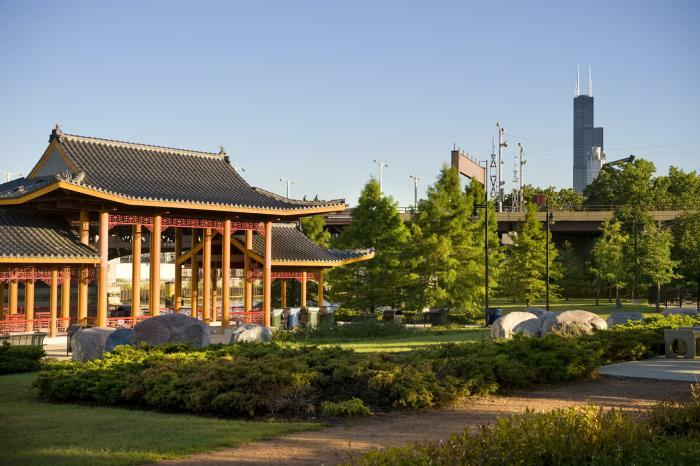 In 1998, the Chicago Park District began transforming the old rail yard, and today, the picturesque park features Chinese landscape design elements (including the pavilion pictured above), a playground and fieldhouse., where you&apos;ll find a multi-purpose gymnasium; a 9-foot deep, zero-depth entry indoor swimming pool; a state-of-the-art fitness center; and a second story outdoor patio with skyline views and green rooftop. Outside, the park offers walking paths by the river and a boat house, which is open for kayak rentals during the summer months. Best of all, though, is the fact that you&apos;re right in the middle of Chinatown, a vibrant, dynamic Chicago neighborhood that beckons you to stroll, shop and savor. For an extra special Chinatown picnic, grab some dim sum to go from Michelin rated Minchin Cuisine (2168 S Archer Ave). Or for something a little more casual, head to Evergreen Restaurant (2411 S Wentworth Ave) for all your favorites, like egg rolls, fried rice and pot stickers. Chicago&apos;s Millennium Park positively glows with inspiring public art installations, cultural and music events, and a beautiful skyline backdrop. The park&apos;s Summer Film Series stands out as one of the most beloved events of the season. 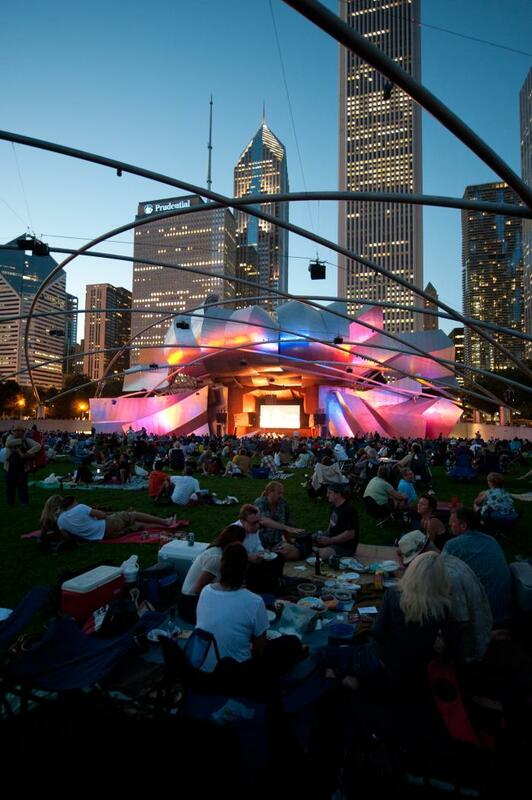 Every Tuesday at dusk throughout the summer, you can spread your blanket on the great lawn before the 40-foot-tall screen at the Jay Pritzker Pavilion for a FREE movie and picnic (stay tuned for summer schedule updates). To make it extra special, pick up a picnic-to-go from Pastoral (located about a block north at 53 E Lake St.). This deluxe packed picnic features a fresh baguette; soft, aged and classic cheeses paired with Wagyu beef salami; smoked, herbed ham; savory pickled veggies; fruit and nut crisps complemented by spicy Dijon mustard; single varietal honey; and unique chocolates for a sweet treat. Don&apos;t forget a bottle of wine; Most parks don&apos;t allow open alcohol, but you can legally drink beer and wine at the Jay Pritzker Pavilion during scheduled evening events. In the 1890s, a certain L. Frank Baum, a reporter for the Chicago Evening Post, dreamed up a fantastical story: A cyclone whirls a young farm girl and her little dog up and away and into a land inhabited by merry munchkins, winged monkeys, a wicked witch and a charlatan ruler. 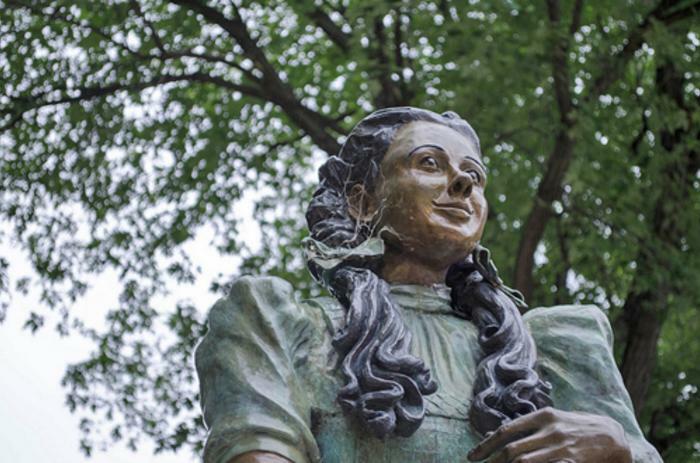 Baum&apos;s beloved characters, which jumped from the printed page to the silver screen in 1939, live on in charming Oz Park, located in Lincoln Park. Tennis courts, a large playing field, and a wonderful play park for children make this a great pick for a morning or afternoon picnic. It&apos;s the statuary here that&apos;s the real draw: From the corner of Webster Avenue and Larabee Street, follow the yellow brick road, where you&apos;ll be greeted by the Scarecrow. At the southeast corner, the bronze Cowardly Lion proudly displays his badge of courage. Dorothy and Toto watch over the children as they head towards the playlot with its swings and slides. The Tin Man guards the northeast corner, proudly displaying his brand new, ticking heart. The statues were all created by John Kearney, a Chicago and Provincetown-based American artist famous for his figurative sculptures fabricated from found metal objects. The park&apos;s delightful, flower-filled Emerald Garden is a particularly perfect spot to spread out your picnic blanket. Pick up an Italian feast to go at nearby Bacinos of Lincoln Park (2204 N Lincoln Ave), where you&apos;ll find hearty salads, stuffed pizzas (including a heart-healthy spinach option) and specialty panini. No picnic is complete without dessert, and Swirlz Cupcakes (705 W. Belden Ave.) has all the to-go treats you&apos;ll need to guarantee a sweet time. Extend your art-filled tour of the Art Institute of Chicago with a pre- or post-visit picnic in the intimate South Garden, where the peaceful landscape is a masterpiece in and of itself. The garden was built on top of a parking garage between 1962 and 1967, and stands as one of landscape architect Dan Kiley’s best-preserved commissions. It has long served as a quiet lunchtime oasis for anyone seeking an escape from the Loop&apos;s hustle and bustle. 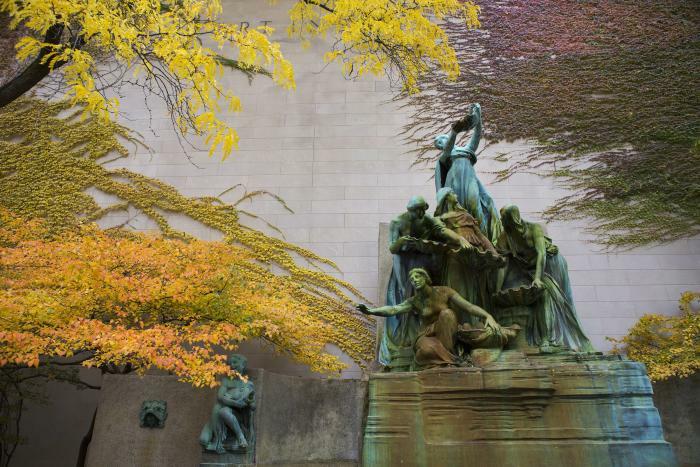 Lorado Taft’s monumental Fountain of the Great Lakes (1913) and its reflecting pool, anchors the garden. Honey locust and cockspur hawthorn trees offer plenty of shade, while raised planters beside the pool make a perfect seating area in which to linger over a classic picnic. Just inside the Art Institute you&apos;ll find the Museum Cafe, which offers all the picnic staples to go, including sandwiches, pizzas and wraps. Here&apos;s a tip: Plan your visit for a Thursday evening and you&apos;ll enjoy extended hours (until 8 pm versus 5 pm) and free admission to the museum. Burnham Park is a 600 acre expanse that sits on Chicago’s Lakefront just south of Grant Park. 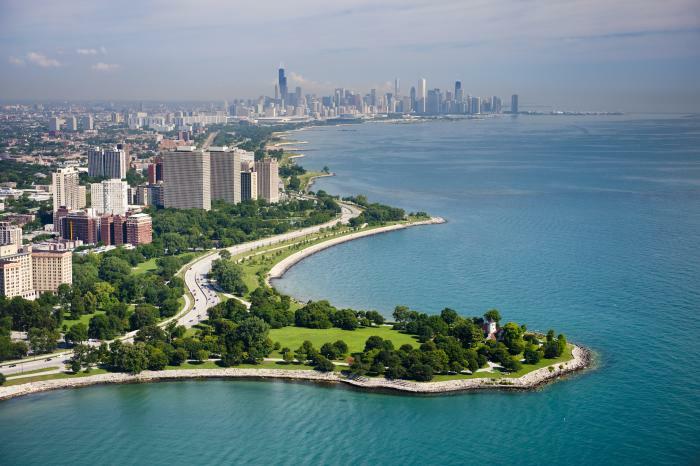 The park was named for Chicago&apos;s famous architect and planner Daniel H. Burnham, who envisioned a south lakefront oasis consisting of a series of manmade islands, linear boating harbor, beaches, meadows and play fields. Today, Burnham Park features the naturalistic Promontory Point designed by Alfred Caldwell (you&apos;ll hear more about him below), a popular skate park at 31st Street, bird sanctuaries and beautiful natural areas. The Margaret T. Burroughs Beach and Park is a newer feature and stretches from 31 Street to 26th Street. In other words, you&apos;re spoilt for choice when it comes to where to lay your blanket and open your picnic basket. And with metered parking at nearby lots, you can cater your goodies from just about anywhere. Wherever you pick, sweeping views, melodic bird song and the wonders of nature will surround you. 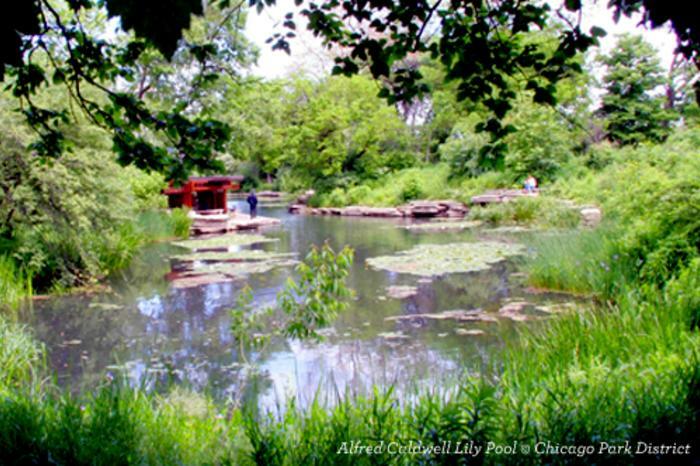 Tucked in a gated corner of Lincoln Park, the wild yet intimate Alfred Caldwell Lily Pool is like your private, secret garden. It promises the ultimate quiet, peacefulness and charm. Designed by renowned architect Alfred Caldwell, the pool&apos;s landscape recalls a lush, Illinois river valley dotted with wildflowers. Caldwell&apos;s goal was to create a natural, Midwestern ecosystem contained within 2.7 acres of gardens. When the city park district cut the project budget, Caldwell, so set on his poetic plan, cashed in his $5,000 life insurance policy for $250 and bought thousands of native plants from Sauk County, Wisconsin, planting them the very next day. The result is an ode to the Midwest. Follow the stonework path that meanders along the lily-spotted lagoon, through the native-plant-filled landscape, and past the gurgling waterfall; ascend the stone steps to the circular council ring, where you&apos;ll find the perfect, concealed spot to spread your picnic blanket: it not only overlooks the pond but also offers a beautiful glimpse of Lake Michigan in the distance.